I’ll be blogging some of my travels this year. It’s been said before, I want this blog to be a resource. Not just to brides planning wedding budgets and such, but also to anyone who wants to live a creative life. It truly believe anyone and everyone has the option to be creative, adventurous, and enjoy life. From the simple things (like recipes) to more extensive traveling or artistic endeavors, I’m hoping to share more from my life with the hopes that it’ll be inspiring and helpful! That said: Welcome to Seattle! Land of Meg Ryan’s #1 hit movie, location of fictional Dr. Meredith Grey’s house, and home to countless coffee and brew houses. Since I don’t make loads of money, I try to travel fairly cheap. That means looking for airline deals and staying with friends if possible. This trip incorporated both! I’ll be blogging later on tips for a budget trip, and this post will mostly focus on what we did & my suggestions on what to see! Ready, Set, Go! What next to do, than to see the market!? Again, it was a weekday morning, so not all the vendors were set up. The ones who were, however, eagerly offer samples of seasonal fruit or other items. Just say yes! And if you have any questions, or want local opinions on restaurants, ask them. Everyone in the market is there to engage with the tourists! Another stop on my bucket list was the Seattle Public Library. I’d seen photos of it a long while back, and when planning for this trip, realized I could see it. In person!!! If you know me in real life, you know I love books, libraries, and architecture. So this place was a *dream come true* for me!! The largest library I’ve ever been in and honestly, I could have soaked it up for hours. Definitely give it a whirl if you’re visiting Seattle! Next, we wandered back down towards the water. You can wander in and out of shops all along the boardwalk (which is great if it’s cold and wet outside, like it was in January!). The perks of going right after the holidays is that you can find plenty of deals on Seattle apparel. If I hadn’t packed in just a backpack, you betcha I’d have bought more than one t-shirt!!! Finally, we ended our Monday with a ferry ride to Bainbridge Island. All you Grey’s Anatomy fans will know that if Derek Shepherd was your tour guide, that’d be the first thing on your list. “I have a thing for ferry boats.” Ferries really do live up to the hype! I had a magical experience walking around the upper deck, taking photos of the city, and having my hair tangled by the winds. Thankfully, you can head inside to sit with great views out the large windows…and even grab a snack or coffee if you need a pick-me-up! Not a lot was going on in January on Bainbridge Island. There were a lot of shops open, they were just quiet with a few tourists and locals around. We wandered in and out, and settled on pre-dinner wine tasting at Fletcher Bay winery. It was a cozy atmosphere—perfect for a wet, cold evening! Heather heard good things about Harbor Public House, just down along the marina. It was dark by the time we arrived— sunset is earlier along the upper coast in winter!! !— but OH MAN. This was a feast! After walking 6 miles that day, we heartily enjoyed our dinner. I highly suggest the seafood curry and lamb burger specials! I’m a fair-weather Grey’s Anatomy fan, but when I found out that the house that is supposedly “Meredith’s house” was just up the hill from Kerry Park (best views of the city! ), I demanded a detour. It was creepy to stand outside someone’s home and take photos, so we moved on pretty fast. Haha! Still, fun to see a pop culture trivia piece in real life. After taking wayyy too many photos at Kerry Park, we walked down the LARGE HILL THAT IS NORTH SEATTLE (seriously—imagine San Fran & that’s what this city is!) to the sculpture park. We weren’t feeling it, so we walked back up the hill into Lower Queen Anne & saw the belly of the Needle. 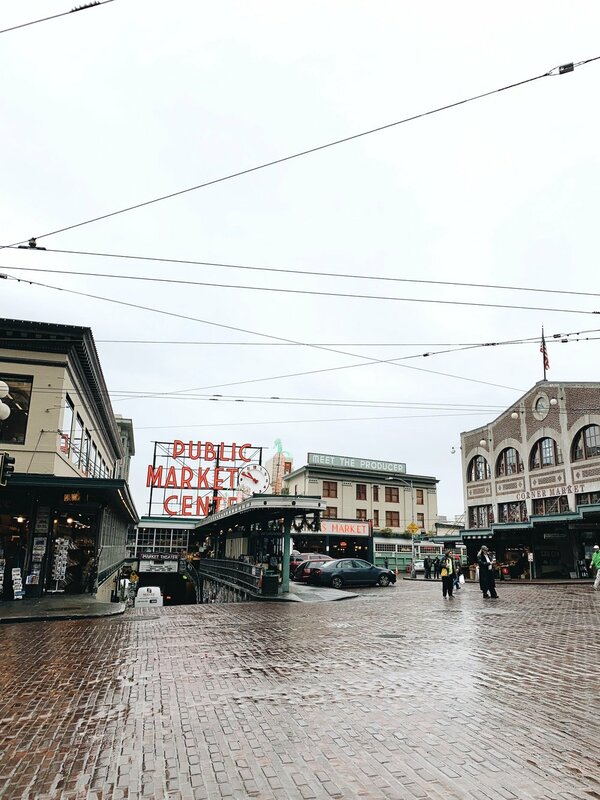 You could spend days just exploring the area around the Needle, and touring the museums & art galleries there! The Space Needle costs a bit of cash, so we opted to just take a few photos and then hop on the monorail back to downtown. That was seriously Heather’s favorite part of the trip! (The monorail!) It did feel a little like being at Disney world. ;) And only cost $2.50 so …definitely less money than going up the Needle. Hahaha! Stupidly, we hadn’t “done” the gum wall in Seattle on Tuesday. Heather was quite excited about it! (No, she didn’t actually lick the wall! Gross.) It’s such a weird site. But also kinda neat! It surprised me how many people spelled out names or initials with gum. Quite creative. It was lunchtime, so we took a car to Seattle’s Chinatown! I’d never visited a Chinatown before, and was quite excited. The restaurant we’d hoped to eat at was closed… so we walked down the street and spotted the Purple Dot Cafe. My one request was to get Dim Sum. And DIM SUM WE GOT! So many small plates of fried Chinese food—and it was only about $10/person. What a deal! Afternoon called for a nap, and some Molly Moon’s Ice Cream before riding the bus back downtown. Travel tip: ride the bus if you don’t want to get wet and quite so tired out! It’s not cheap, but is cheaper than an Uber or Lyft ride. Heather and I had planned on happy hour at Smith Tower. The oldest skyscraper in Seattle boasts historic facts, and an old-fashioned speakeasy! Plus, discount tickets and drinks are an automatic win. Heather and I grabbed breakfast after staying our first night in Puyallup. There are a variety of cafes, but we chose The Buttered Biscuit for their cute name and large breakfast selection. Definitely get the fruit french toast! So yummy. Then, my dream for plant life without costs came trueeeee. The Seattle Volunteer Conservatory is free this January and February! It’s the prettiest victorian style hothouse, with rooms hosting a wide variety of plants. My only wish was that it was larger—but still, you can spend quite a bit of time there, especially if you want to read and learn about the flora. We wandered down into Capitol Hill, and discovered a sweet little coffee shop. I’m currently obsessed with records after acquiring a turntable in December, so it was fun to stop for coffee in “Victrola.” After, we walked back up and shared a flight of brews at Optimism Brewing Company. They had lots of space, and great windows for people watching the locals! Seattle lived up to the hype. January weather is mild, but still chilly and wet. However, Friday we finally got to see the sun! With the sun and clouds clearing, that also meant we saw “The Mountain” aka Mount Rainier. The view on our walk to the train station was breath-taking. Our one museum choice (ok, MY one museum choice!) for this trip was the Museum of Flight. After all, what better way to get to know the local history and stay warm in the winter!? This museum was worth every penny and I’d go back again to see the spots we missed, and maybe catch a new exhibit! Also, standing in Air Force One was surreal. Lunch downtown meant pasta for Heather, and my first Poke bowl! Pretty and yummy. My friend Callie suggested Storyville Coffee. Hands down the best French Press I’ve ever had! The view of the harbor is great (especially at sunset!) and the staff not only provides EXCEPTIONAL service, but free chocolate cake! Randomly! For FREE!!!! There you have it—the main attractions we did/saw while in Seattle in January. I packed in a backpack—and most days just wore jeans, tennis shoes, and a sweater with my blanket scarf and raincoat. My face got cold sometimes after walking around outside, but otherwise, I stayed mostly dry and warm! We averaged walking 6 miles a day, so make sure to take comfortable shoes if you don’t plan to Uber everywhere. If you have any questions, just comment below and I’ll do my best to answer! I will also be posting on how we did this trip in a budget-friendly way, in the following weeks. Yay for fun travels without breaking the bank!